Each 1200mg Fish Oil softgel provides a total of 720mg of omega-3 essential fatty acids, including 388mg EPA and 260mg DHA as triglycerides (TG). 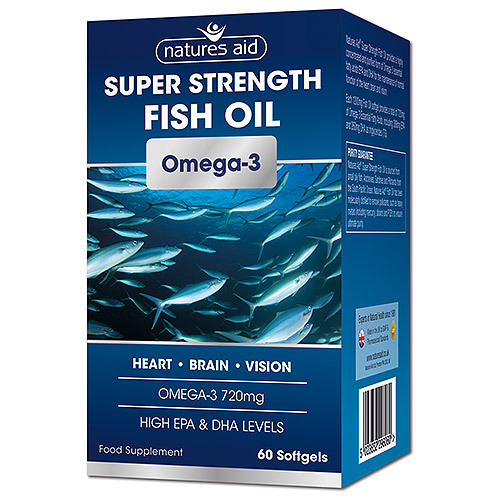 Natures Aid Super Strength Fish Oil is sourced from small oily fish; anchovies, sardines and pilchards from the South Pacific Ocean. Natures Aid Fish Oil has been molecularly distilled to remove pollutants such as heavy metals (including mercury), dioxins and PCB`s to ensure ultimate purity. Pure Fish Oil, Gelatin (Bovine), Glycerine. 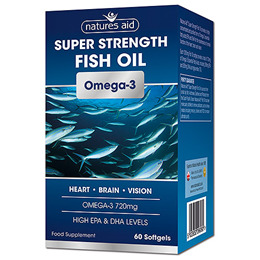 Below are reviews of Natures Aid Super Strength Fish Oil - 60 Softgels by bodykind customers. If you have tried this product we'd love to hear what you think so please leave a review.